It is not the life I would have chosen, but it is the life that I’ve got so I try to make the best of it and smile at the simpler things in life. I believe that you have to give in to M.E. in order to recover. Let it win the battles in order for you to win the war. Giving in to it is not giving up. It is merely tactical. Like other illnesses, we cannot fight it. We have to work with it much as we hate it. I have had to accept that I am not, and cannot be, the person I was before I became ill. It has not been easy but I have started to adapt my life to fit my new limits. Again, this is not giving up. To maintain my independence I have had my hair cropped short so that I am able to wash it myself. My arms are too weak to manage anything longer at the moment. I would never have been brave enough to do it before. Not many people like it, but I have more important things to worry about than what I look like or whether people approve of my hairstyle. 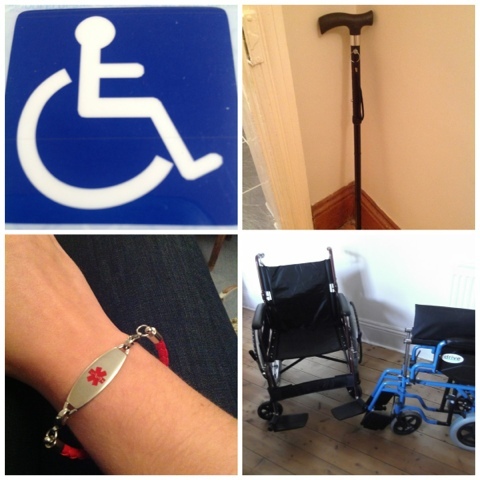 On the handful of times that I am able to venture out of the house, using a wheelchair means I can save the energy I would use walking for other things such as chatting to friends or cutting up my own food in a restaurant. It was not an easy choice. I never imagined I would ever have to make such a decision and with my legs becoming weaker, and my walking slower, it was surely the sensible and best option. Of course my brain and body will still throw a wobbler afterwards, but the aftermath may be slightly less horrific than it would have been without the wheelchair. My friends find the wheelchair highly entertaining and feel the need to use it themselves if we are out together. Apparently it comes in handy to hang their bags on! Their ‘driving’ skills leave much to be desired, but I am a firm believer in laughter being the best medicine!!! Previous Just tired? We wish! Next Don’t give up on us. Please.